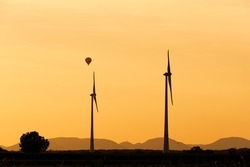 The Spanish energy group Naturgy has announced the construction of a wind cluster: Nine wind farms will be built for 300 million euros in 16 municipalities in the provinces of Burgos, Valladolid and Zamora in the central Spanish region of Castilla y León. "With this commitment of around 300 million euros in Castilla y León, Naturgy continues to work on the development of renewable energies in Spain, with a total project of around 1,000 million euros in 2020 across the country," said Ana Peris of Naturgy. These wind farms, which will create around 1,000 jobs in their various construction phases, will have a total output of more than 300 megawatts and produce around 950 GWh of electricity per year, equivalent to the annual electricity consumption of 380,000 households. This is about 24 percent of the total volume of electricity in Castilla y León. Naturgy was awarded the contract in previous Spanish auctions.